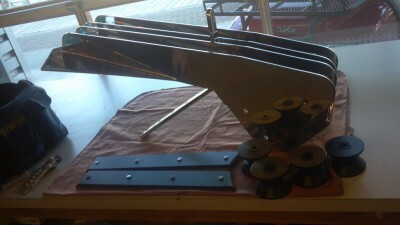 We fabricated this bow roller for a customer from scratch. Crafted out of stainless steel, this bow roller system carries two anchors and has an attachment for the headstay to hold up the yacht's mast. This is an integral part of the bow of the boat. Made completely of Delrin acetal polyoxymethylene resin, the skid plates and rollers we used are an integral part of the self-launching system. With a single hand, two anchors can be launched from the bow of the boat, ensuring stable anchoring of this 37 foot yacht.